The CRS program which is run by FEMA through the National Flood Insurance Program (NFIP) scores communities on their effectiveness in dealing with flood mitigation as well as flood plain management and development. 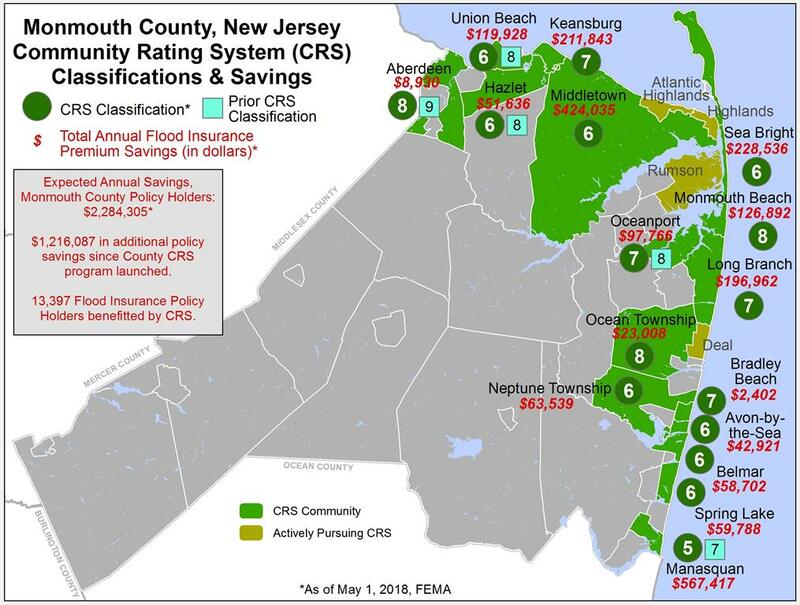 Flood insurance policy holders in participating CRS communities are eligible for discounts in Special Flood Hazard Areas based on their community’s CRS rating. The Monmouth County Division of Planning and the Monmouth County Office of Emergency Management have partnered to offer their professional and technical expertise in hazard mitigation, community planning, public outreach, and GIS mapping to municipalities that wish to participate in the Monmouth County Community Rating System Assistance Program. For more information on this program click here. Please visit the Office of Emergency Management CRS website for more information on the CRS program including important links to resources to get your community started in this program. For the current edition of the CRS Newsletter, click here. Monmouth County employees recognized for Floodplain Management Leadership by the New Jersey Association of Floodplain Management (NJAFM). Monmouth County is honored to be recognized as a National Association of Counties (NACo) 2016 Achievement Award Winner in the Category of County Resiliency: Infrastructure, Energy & Sustainability for the "Monmouth County Community Rating System Assistance Program".